A batch of large blueberry bushes just arrived at Marvin Gardens. The bushes are mature and currently producing fruit, ready for summer harvesting! Prepare your garden bed with granular sulfur, coffee grounds or 4-6 inches of peat – blueberry bushes enjoy high acidity. 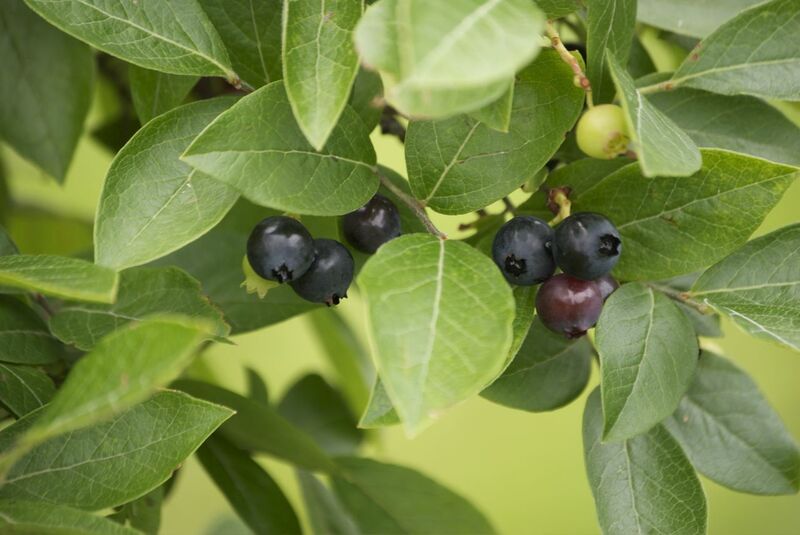 Stop in during business hours or call (203) 544-2020 to reserve your blueberry bush today. Winterthur (pronounced “winter-tour”) is a garden, museum and library located just outside of Wilmington, Delaware. The estate was once owned by Henry Francis du Pont, a famed horticulturist and decorative arts expert. Winterthur houses the top-recognized collection of American decorative arts in the world, with many rooms decorated of its period. The garden itself, designed with the help of landscape architect Marion Coffin, is considered to be one of the best in the nation. The lawn at Winterthur was once used for recreational purposes– particularly croquet and tennis. However, du Pont’s passion flowered into plants, thus the sports site was transformed into a naturalistic garden. Lush flowers, gentle inclines, winding paths and babbling brooks define the 60-acre retreat. A mixture of azaleas in the woods is a perfect partial-shade area to plant. Get lost in time in the Sundial Garden. 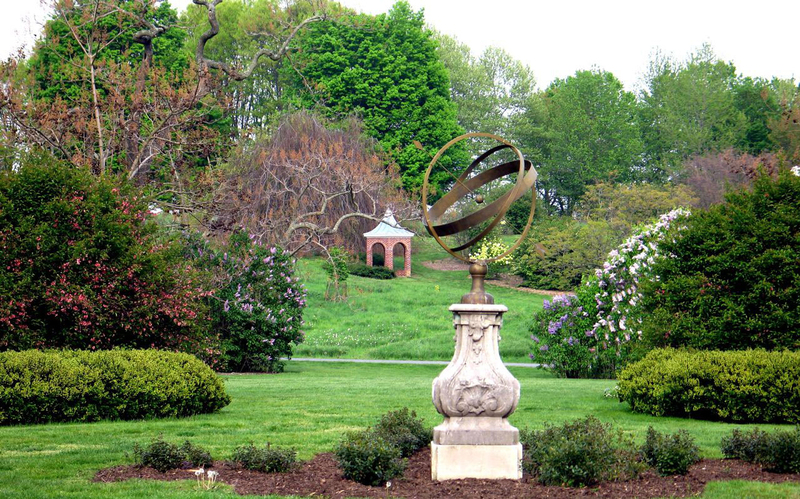 Any of these elements from Winterthur may be incorporated into your garden. All you have to do is take a walk and find the inspiration! Most of us have a hand/body lotion or two (or ten, in my case) that embodies our favorite floral scents. Some of the lotion names and the flower of which the scent originates are fairly obvious. However, did you know that “sweet pea” is an actual flower and not a term Bath & Body Works made up for their product line bearing the same floral name? Here are some popular spring flowers that also share a kinship with body care fragrances. Cherry blossom. A sight– and smell– to behold once the trees are fully bloomed. Freesia. One of the most popular gardening plants for its vase-friendly stems and slight citrus scent. Gardenia. These are unmistakably aromatic– as well as beautiful– with cream-colored blooms set against deep-green leaves. Rose. A flower that bears much symbolism, a scent that appears in so many products. Sweet pea. Known as the Queen of Annuals in England, this flower’s color variations and sweet scent make it a gardener’s favorite… as well as mine. Have these flowers around the house, and your rooms will be sure to smell like your most admired body care scent… or is it the other way around? Tillandsias are an interesting type of tropical plant that is part of the bromeliad family, which includes pineapples and similar ornamentals. 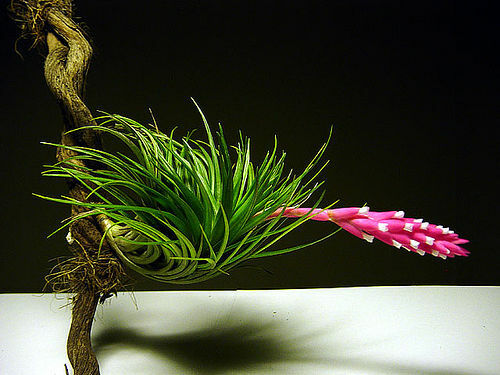 They are often referred to as “air plants” because they do not require soil to grow. Tillandsias are sensitive to frost– so they work best indoors, in plenty of sunlight. The plant is relatively easy to care for, but it’s not intuitive. Here are some tips on how to foster the growth of your Tillandsia so that it may bloom for years to come. 1.) It’s best to purchase a fully grown Tillandsia from a nursery, as it will take years before seeing a bloom on a seed-started plant. 2.) House the Tillandsia in a container with holes in the bottom. The plant requires dry-out time in between waterings. If your container fills with water, you must empty it. 3.) If you want to mount the Tillandsia instead, attach it to the desired surface with wire, twist ties, fishing line or any other fixative. 4.) Tillandsia must be fertilized every month, from March through October. 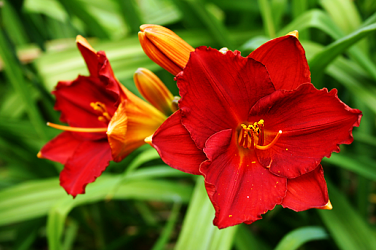 Over-fertilizing will burn the plant, so dilute the fertilizer mixture into one-quarter strength. 5.) Snip off the extra offshoots, or pups as they’re called, that grow at the base of the plant. If you’d like to start a new Tillandsia from an existing one, the right time to separate a pup is when it is half the size of its primary plant. Tillandsia is a simple way to add greenery and blooms to a room without having to worry about potting soil and stringent sunlight requirements. 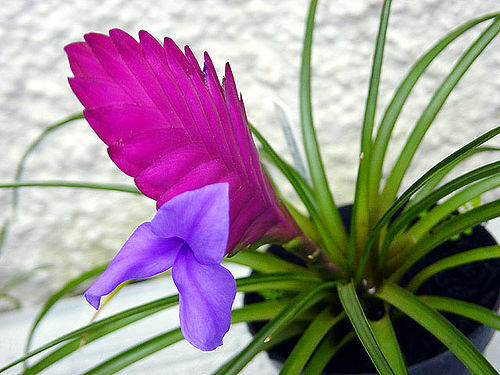 Ask Marvin Gardens to incorporate Tillandsia in your home! If you’re not familiar with the Soho House, it is a collection of private clubs, hotels and spas that has several locations throughout the world– the first being established in London, England. Usually, memberships are reserved for those involved in media, film and other creative industries. Yet some parts are open to the public. 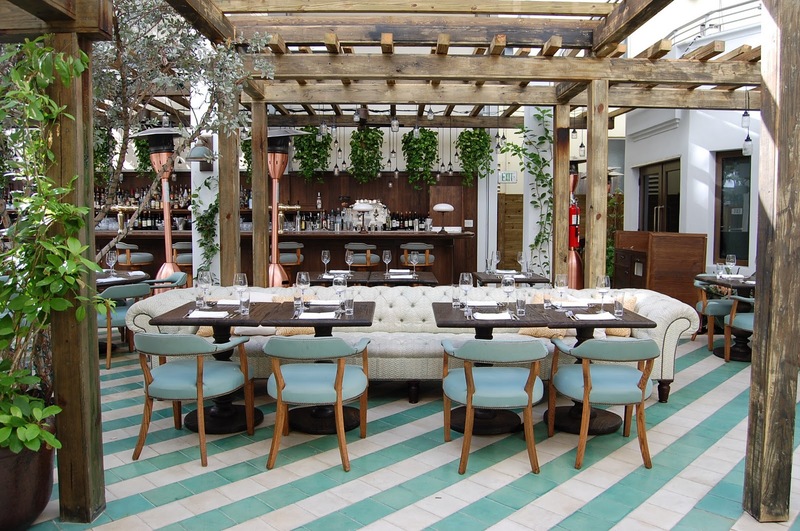 The Soho House empire’s newest addition is the Soho Beach House in Miami. 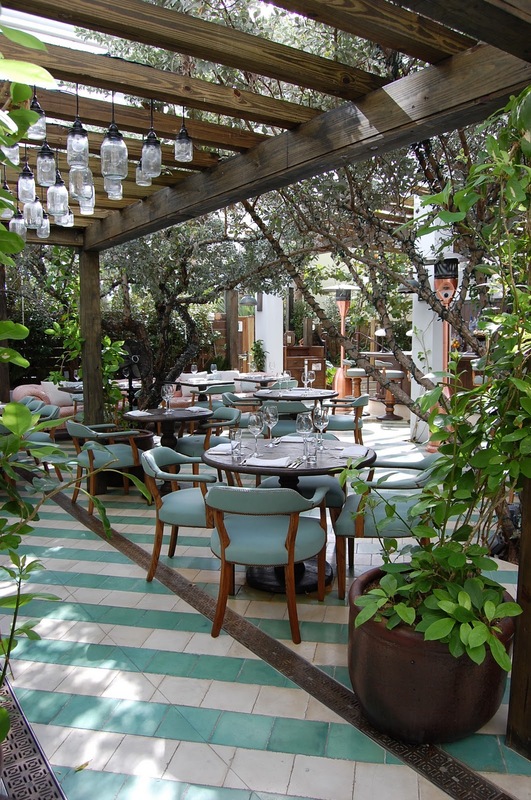 The public restaurant on site, Cecconi’s is a stylish nod to the English origins of the first Soho House. Hanging plants adorn the ceilings and potted plants are abound, making you feel like you’re in an English garden. The long and deep-buttoned Chesterfields lend an additional English air. 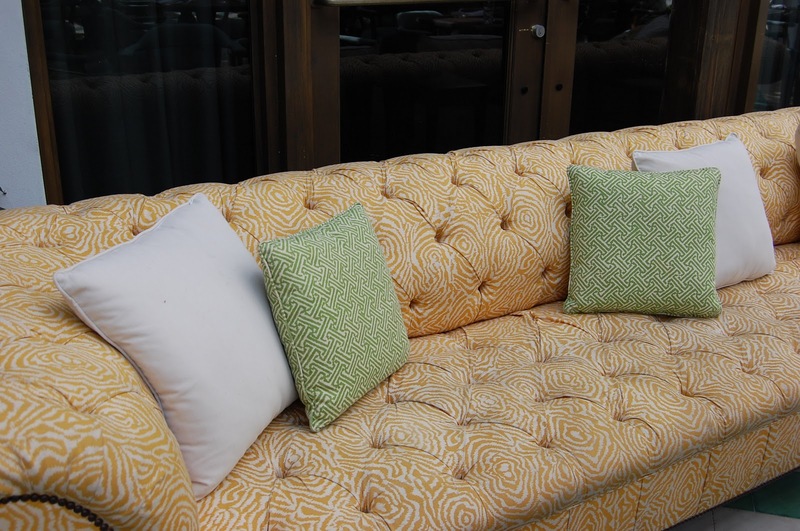 The sea green-colored tile and chair upholstery bring a bit of Miami into the mix. 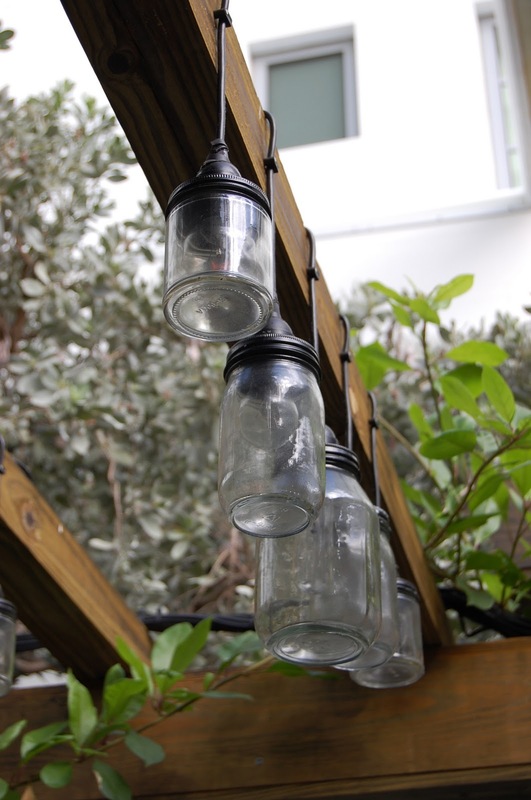 Belljar lighting accents with English whimsy. Soho Houses may be private, but the decor is not exclusive. 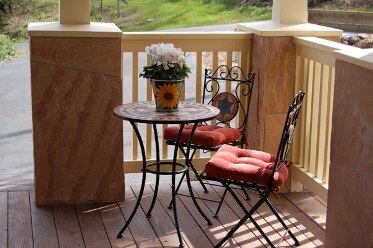 These landscape, color and furniture schemes work well in any home, whether indoors or outdoors. 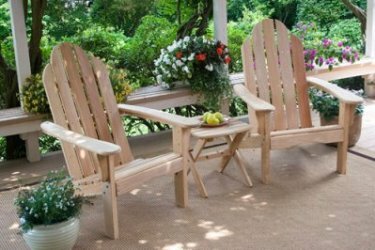 Marvin Gardens can make it happen for you, too.